So many families are getting wiser when it comes to financial spending. It’s so great to see so many planning their meals and making the most of their food. Breakfast is probably the absolute easiest way to do this, in my opinion. Having three kids under my roof, I am a stickler for breakfast being the most important meal of the day. The best part is that the most important meal in our house is also the least expensive. Most weeks we spend $10 on breakfasts to meal prep for our family of 5 by sticking to a few healthy ingredients. 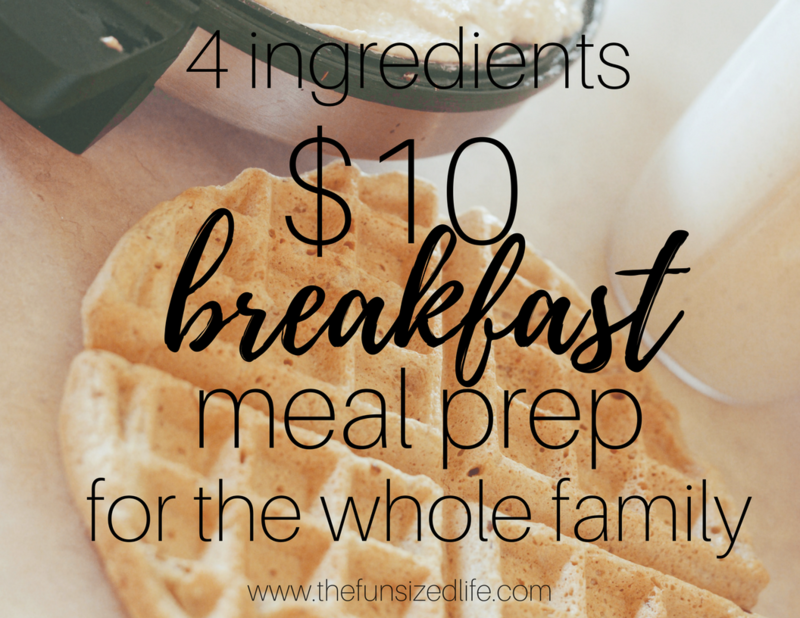 So I’ve decided to share a few of my favorite $10 breakfast meal prep ideas for our family of five. To keep our meal prepping inexpensive, I generally stick with a few simple ingredients. I do a lot of shopping at Costco and Trader Joe’s, however, for those of you who barely have time to even make it to the store, there are a lot of great online grocery options these days. Personally, I recommend checking out Thrive Market. They offer major savings on tons of healthy, organic and GMO free foods and just for signing up you can currently get 20% off your first 3 orders!! That is huge savings! The best part is, you get the food sent strait to your door so you don’t have to step foot inside the super market! These waffles are crazy easy and super healthy with only bananas, water and oats. All I do is toss the ingredients into my Nutribullet until they are fully blended (like 5 seconds) and then cook them up in my waffle iron! 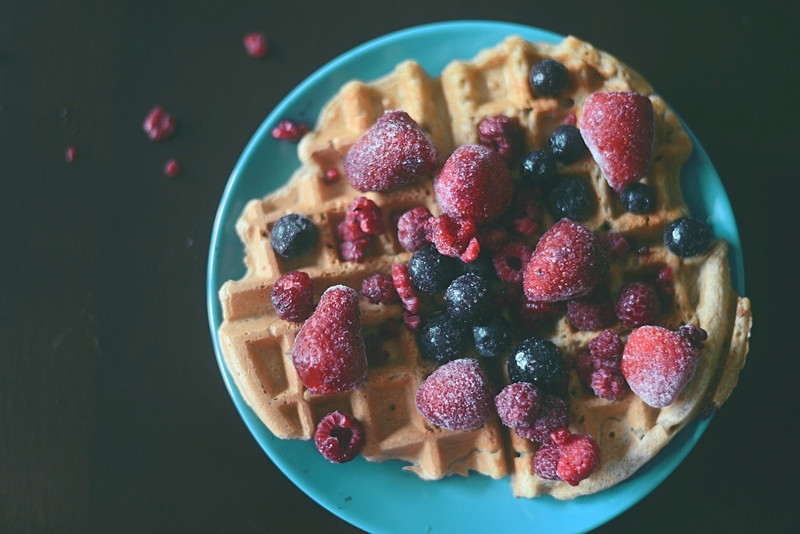 When your waffles are all prepped and ready to go, you can top them with fresh or frozen fruit (we heat the fruit up on top.) Another easy option is spreading a little peanut butter on top and finishing it off with bananas and cinnamon. I usually meal prep 2 batches of waffles to get us set for the week. While my kids would happily eat the entire circle of waffles, I limit them to half a circle with fruit on top and the occasional egg on the side depending on how much time we have in the morning. These are hubby’s favorite breakfast to meal prep because overnight oats are crazy easy to grab on the go! I will either make a big batch or I will make separate servings and store them in Mason jars. Literally open the fridge, grab a jar, and head out the door! Plus, you can easily add extra goodies like chia seeds, flax, hemp seeds or sweeteners like honey or cinnamon. The best thing with meal prepping overnight oats, (besides the Mason jar) is that you can make them any way that you want. If you checked out my original recipe, you know we love our oats with peanut butter and chocolate chips. You can also top them with fruit, nuts, yogurt or granola (just don’t leave that overnight). This time around I opted for frozen fruit. After mixing the oats and milk, you leave them to sit in the fridge overnight. Putting frozen fruit in with the mixture allows the fruit to soften overnight and gives the whole jar a nice fruity flavor! Meal prepping is a great way to stay ahead and save yourself tons of stress throughout the week and these recipes make it super easy. If you are living life on a time crunch, but still want to eat clean as much as possible, check out my top recommendations for the best to your door healthy food deliveries. Eating healthy on a budget is totally doable! There are so many great products out there and great recipes if you just learn to be clever about it. It’s amazing how far these little oats can really stretch your budget AND keep you filled up! My Black and Decker waffle iron hasn’t steered me wrong yet! Thank you! I’m glad you were able to find new things! Gracias, me alegro de que fueras capaz de aprender cosas nuevas.